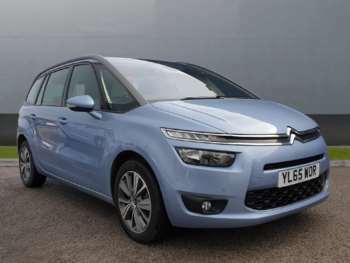 The Citroen C4 Grand Picasso emerged as an MPV back in 2007, offering another compact seven-seat option to families who need a bit of extra room but don't want a full-sized people carrier. The Picasso range has long been part of Citroen's stable, although it was the Xsara Picasso that started it all. A used C4 Grand Picasso is a real step up from its predecessors because it offers an impressive degree of luxury and space, along with the latest technology, making it thoroughly modern. The used Citroen C4 Grand Picasso is an attractive looking car with distinctive styling that helps it to stand out. A large, panoramic windscreen gives you great views, while the interior space is really worth noting. What’s more, the flexible seating really deserves praise for its simplicity and effectiveness. The Citroen C4 Grand Picasso does suffer from featuring a somewhat confusing dash layout, if only because it doesn't follow the same template as other modern cars. Once you're used to it, there should be no problem, but there is a little bit of a learning curve. Those who opt for a diesel engine will get good fuel efficiency combined with decent enough power to sustain excellent cruising speeds. Of course, the diesel models will cost you more, which means those with shorter journeys to make might be happier with a petrol powered alternative. But either offers a solid family car driving experience. You get your choice of either 1.8-litre or 2.0-litre engines onboard the C4 Grand Picasso, and these are practical and efficient enough. Although a second-hand Citroen C4 Grand Picasso may not be at the top of the class in its category, it is a great used buy for families.